Alicia Leal graduated from the San Alejandro School of Fine Arts in 1980. She is a member of the National Union of Cuban Writers and Artists (UNEAC), the UNESCO International Association of Art (IAA) and the Commission on the International Image of Culture. 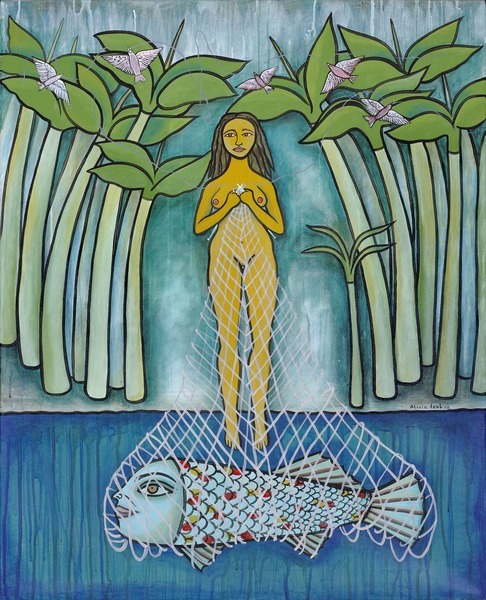 She received Third Prize at the National Landscape Salon, sponsored by the Guantánamo Art Center in Cuba in 1990; Third Prize granted by the French firm Façonnable in 1997; and in 2001 she was awarded the Distinction for National Culture and the Artistic Merit Diploma of the Superior Institute of Art in Cuba. 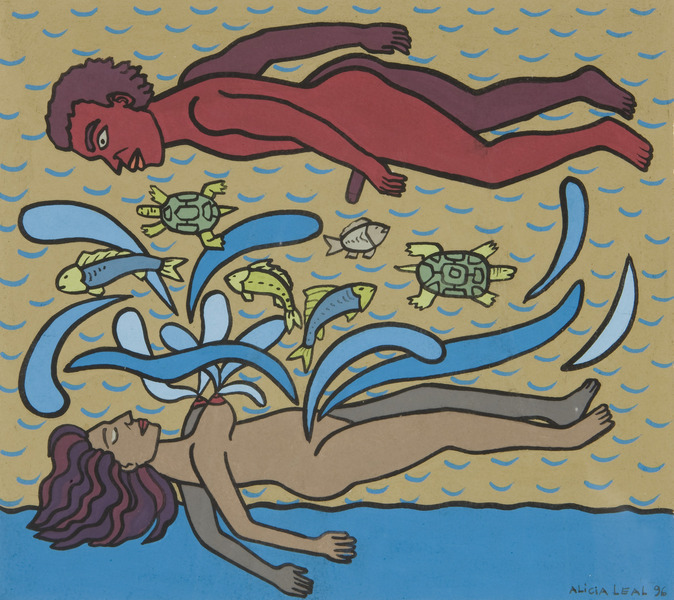 Her works are part of the collections of various institutions, including the Center of Cuban Studies and the Spanish Embassy to the UN, both in New York; the Museum of the Americas in Managua, Nicaragua; the Museum der Bildende Kunst in Leipzig, Germany; the University of Saint Thomas in Houston, Texas; The National Gallery of Jamaica in Kingston; the Capilla del Hombre, Guayasamin Foundation in Quito, Ecuador; and the Wisma Kebudayaan SGM in Kuala Lumpur, Malaysia. Amantes (Lovers), 1996. Acrylic on paper, 10 1/2 x 9 1/2 in. San Lázaro (Saint Lazarus), 1990. Acrylic on canvas, 21 1/4 x 28 3/8 in. Untitled, 2008. Acrylic on canvas, 40 x 32 in. Untitled, 2009. Acrylic on pressed board, 19 1/2 x 15 1/2 in. Odette y el cisne (Odette and the Swan), 2008. Acrylic on canvas, 15 1/2 x 14 in. Untitled, 1992. Acrylic on canvas, 21 1/4 x 25 3/4 in. Untitled, 1996. Gouache on paper, 9 3/4 x 13 in.